Rate this Article Want to hang out with the Villain Kids, find things for the Seven Dwarfs and organize hip school parties? Then it's all happening in the magical and trendy world of Disney Descendants, where Mal, Jay and Evie are waiting for you to join their exciting adventures. 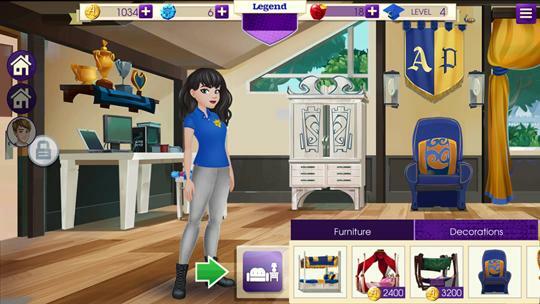 Disney Descendants is a virtual game based on the hit movie of the same name. Based on the sons and daughters of notorious Disney villains, the game features the characters known as Villain Kids. Other than hanging out with these kids, you’re given your own dorm and lots of exciting quests to do with your new-found buddies. Here are six great reasons why you should enter the virtual world of Disney Descendants. The premise of Disney Descendants is pretty interesting and has never been done before. The personality of each Villain Kid rings true to their descent, yet also far from it. Not to fear, however, as these VKs do their best to go against the stereotype of villains – and are actually nice to you! Although you are constantly reminded of who these kids’ parents are, it won’t really matter since they use their powers for the greater good. Being a game made by an entertainment giant like Disney, you can expect polished and high quality graphics with this game. The details on each character are superbly done, and it’s as close to the movie as it can be (for an animated version). Although there’s not a lot of animation performed by characters, the art is enough to keep you visually delighted. The interface is elegant and easy to navigate which makes the game a keeper. It’s sometimes hard to earn enough coins to buy what you want in most virtual worlds, but this game takes care of that for you. If you log in to the game every day, you’ll get a random gift ranging from gems, coins, energy and special clothing items. The game also gets updated with new missions and quests, sometimes happening at a magical location. Missions like Isle of the Lost will take you to a mystical island, while The Seven Dwarfs Scavenger Hunt will have you searching for seven items for the busy dwarfs. Most “fashion” games will often offer clothes with one or two themes, but not in this game. Here in Disney Descendants, you can mix and match pieces to express yourself. Wear a dress with combat boots and let your personality shine! You won’t get your generic black dress and heels in this game, but you’ll get newer, trendier styles that will speak to next generation gamers. The dialogues in this game are crisp and witty, much like the movie. You also have a hand on how to respond to other characters, which makes you feel like you’re actually part of the conversation. If you want to get an idea of how the younger generation holds a conversation nowadays, this game is worth your download. It makes the game all the more engaging and never boring. From the outside, this game may be about superficial things like going to parties or dressing up. Surprisingly, there are a few valuable life lessons that are sneaked in along the way. In one quest, you’re tasked to face someone who’s lying about something, but you manage to resolve it peacefully by talking to the person. In another, you need to find out what music people liked so you can play it at a party. It may be a small thing, but this game is trying to teach you something other than what’s the best outfit to wear. As an adult, Disney Descendants can still be fun and will make you feel like a kid again. As a teenager, this game is all sorts of awesome. There are parties, adventures and a sense of independence balanced with responsibility. But no matter how old you are, there is an exciting world that awaits your thrill-seeking spirit in the land of Auradon Prep and its many excellent students, including you.